For a free pdf of this Ebook sign up above. I know, you are still looking for an easy answer, but when it comes to ideal weight charts for men there is more than one chart. You may be better off to use something other than weight to measure your body. If you are interested in sports, I suggest you see ideal body fat percentage, if you are interested in weight lifting and body building I suggest you see ideal body measurements for men. The weight chart below is the most common ideal weight chart used and is based on the body Met Life Tables and is based on information collected by the insururance company. This chart is best for average men seeking a healthy weight. After viewing the chart see other ideal weight charts for men that may suit your goals better. 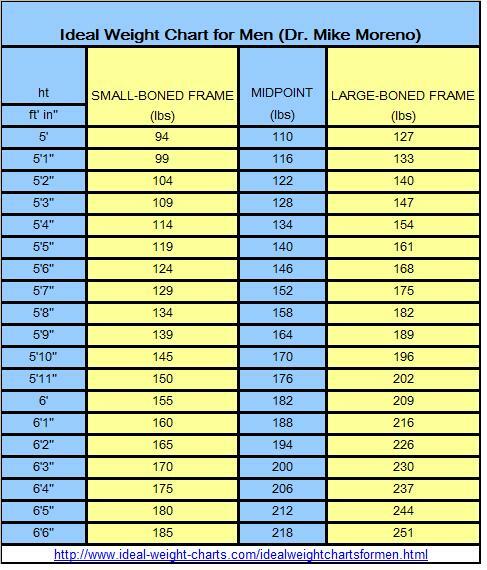 If you have always wondered what size frame you are, here is the method the insurance company used. This will be easier with the help of a friend. Extend your arm in front of your body bending your elbow at a ninety degree angle to your body. (your arm is parallel to your body). Keep your fingers straight and turn the inside of your wrist to your body. Place your thumb and index finger on the two prominent bones on either side of your elbow, measure the distance between the bones with a tape measure or calipers. Compare to the medium-framed chart below. Select your height based on what you are barefoot. If you are below the listed inches, your frame is small. If you are above, your frame is large. Remember, it is not just how much one weighs, but also how much of that weight is muscle and how much is fat. Check out these body building tips. Whatever you do get started with some kind of exercise routine. When it comes to ideal weight charts for men, there are a lot more than just one chart. This chart was taken from a book I just had to buy, because it had so much information that I knew I would want to use it over and over again each time I go back on a diet. Many other Doctors and the cdc recommend using a BMI chart for seeing if you are at a healthy weight. Try and stay in the yellow.